The list every business wants to be on. We rate companies on the basis of confidential employee surveys weighted against the level of employee participation. If a company has high scores in each of our categories but only a small percentage of their employees responded, it won’t do as well as a company that scored well and had a higher rate of participation. The research firm Fieldwork Webwork conducts the surveys and ranks the responses across 10 categories: benefits, communication, corporate culture, hiring/retention, executive leadership, performance standards, responsibility/decision making, rewards/recognition, training/education and workplace environment. 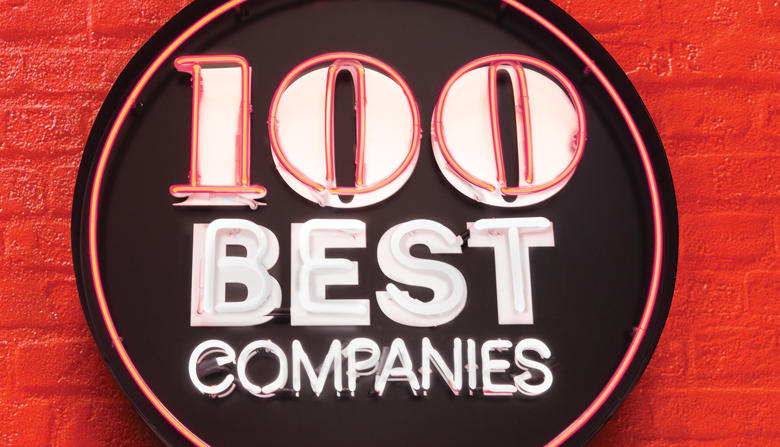 Congratulations to this year’s 100 Best Companies to Work For! Rankings are based on scores derived from confidential employee surveys. Quotes are actual comments given anonymously by employees. Cofounders Michael Bourbonnais and Sean Masters exude positivity. A rigorous hiring process ensures that Tangelo employees are just as upbeat — something that patients of the sports medicine/chiropractic clinic appreciate. The accounting firm recently initiated “half-day Fridays” during the non-peak season. Employees still get paid for a full-day’s work. The firm provides catered lunches during the busy tax season. This maker of marketing-performance software gets high marks for the leadership of cofounders Aaron Bird, Andy Turman and Peter Thompson — and for an environment that encourages independent thinking. “Our culture is hands down the best because of the Trieu family’s leadership,” says an employee of the nationally accredited cosmetology school, which operates campuses in Everett, Bellevue and Renton. Internet entrepreneur Edward Yim is CEO of this advertising website and of the preceding company on the list, Full Beaker. He gets credit from employees for welcoming new ideas. The creator of the “mobile business card” has a “culture committee” that organizes events to bring everyone together and have fun. A dog-friendly office and free gym access also rate. Versium helps clients increase marketing effectiveness by predicting customer behavior. It helps its employees save money by being situated at a shopping mall, with plenty of free parking. Demo Fridays, “when we get together to drink beer and show off the cool things we’ve been working on,” make a definite impact at this provider of video-management software. Among architecture/design firms, Ricer Fergus Miller stands out. “Over and over again, we hear from potential employees that there is nothing out there like RFM,” says a proud staffer. From “I’m allowed to wear Rollerblades” to “dogs, Kegerator and ping pong” to “high standards without high pressure,” the maker of metamaterials-based radar products wins consistent acclaim. Employees at this texting-software company can bring their dogs to the office. And that’s not all. Gourmet-lunch Fridays and “an awesome and welcoming culture” garner high marks. A former University of Washington professor, Etzioni has built a culture that combines the best of startups and academia, emphasizing goals, growth, openness and continued education. Free snacks and lunches are great, but “sincere and open communication at all levels of the company” register big at the national clearinghouse of contact information. The goal of this developer and owner of upscale apartment buildings is to create “quietly awesome” experiences for its tenants. Employees say the workplace vibe is similar. Axon's focus is on doing things differently. There’s not an area where the executive sits that is quarantined off. No one has offices. It allows for a lot of free thinking and talking on the go, and allows people to collaborate in a way that is action oriented. Founded in 1933, the credit union supports 7½-hour workdays for its staff members and emphasizes its longstanding commitment to the local business community. The public accounting and business advisory firm offers flexible work weeks and “a collegial atmosphere” not normally associated with the CPA industry. “I feel like I’m working with friends and extended family,” says one associate of the wealth management and financial planning firm. “Awesome people,” says another. The consulting firm’s annual meetings, always held in a tropical place like Hawaii or Mexico, serve to inspire and motivate, in the words of one staffer. Employees at this “easygoing” maker of social games get to work from home on Tuesdays and Thursdays and enjoy catered lunches at the office on Monday, Wednesday and Friday. “Our top-notch directors create a culture of inclusivity, knowledge and expertise — and lighthearted fun,” says one member of the management consulting firm. The online real estate database company is health conscious. It offers gym-membership reimbursement, Fitbits for all staffers on their first day, standing desks and treadmill desks. From unlimited personal time-off, to Fido Fridays, to team-sponsored happy hours - Payscale truly believes in flexibility and trusting its employees. Inrix provides real-time traffic information globally. Closer to home, it has a water-ski boat docked two blocks from the office that employees can take out anytime. Says one member of the consulting firm: “You believe you are wanted and needed in the company.” Eighty percent of its consultants have at least eight years’ experience. Pushpay is extremely purpose driven. “People here are very aligned. We believe that a healthy organization is one with a lot of clarity," says a member of the team. The full-service electrical contractor offers its employees unlimited vacation and paid volunteer time. It opened a second office in Seattle to ease commute times for some workers. While continuing to grow as a major employer in King County, the insurance company manages to foster “a small-business feeling,” says one employee. For management and staff of this fast-growing hotel-management and hospitality-consulting firm, the popular abbreviation “OMG” means Own the values; Make it fun; Get it done. “A family-owned business that treats its employees like family.” That’s one staff member’s assessment of the home health care provider’s operating style. The drive at this mobile software firm is palpable: “Everyone is striving to turn this place into their dream job,” according to one employee. Beer on tap and “the best view” rank among the cherished perks at the provider of websitedomain registry services. “Morale is as high as can be,” says one employee at the local office of the online streaming TV programmer. What strikes people is our most senior leaders are sitting among our team. You’re never too far away from a leader, and they’re never too far away from you," says a member of the company. “Management really cares about providing a workplace that’s focused on employees first,” says a member of the construction firm. This insurance agency is described as being “more employee focused” than most companies in the industry. 12/ Cowi North America Inc.
“The benefits are fantastic” at one of the world’s leading bridge, tunnel and marine engineering consulting firms.